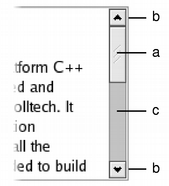 The length of the slider is usually related to the value of the page step, and typically represents the proportion of the document area shown in a scrolling view. The page step is the amount that the value changes by when the user presses the Page Up and Page Down keys, and is set with setPageStep(). Smaller changes to the value defined by the line step are made using the cursor keys, and this quantity is set with setSingleStep(). 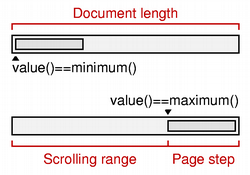 The relationship between a document length, the range of values used in a scroll bar, and the page step is simple in many common situations. The scroll bar's range of values is determined by subtracting a chosen page step from some value representing the length of the document. In such cases, the following equation is useful: document length = maximum() - minimum() + pageStep().